REUSING beer bottles, recycling product labels or cutting waste production can make a big impact on the bottom line - just ask the winners of this year's sustainable business awards. 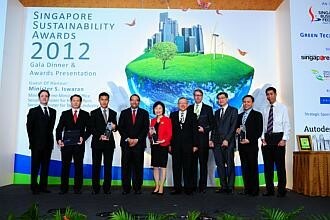 There were 17 winners - 10 firms for sustainable business practice and seven under green technology - with Sembcorp Marine, Qian Hu Corp, the Housing Board (HDB), TP Vision Singapore and Cyclect Energy taking home the top honours. Mr Victor Tay, chief operating officer of the Singapore Business Federation (SBF), told a briefing yesterday that about 50 applications, from public-listed and private firms, including multinationals, from 16 industries were received. The winners were judged on their sustainable business practices, pro-environment operation, corporate responsibility and innovation. He added that the firm has cut electricity consumption by 12 per cent - enough to power 47 HDB blocks a month. TP Vision, which makes and markets Philips-brand TV sets, was another winner. HDB director Alan Tan said the organisation, which won top honour for the green technology awards, is conscious of the need to create well-designed townships and well-used spaces to meet the community's needs. The awards, now in their third year, are an SBF initiative to encourage businesses to employ long-term sustainable development goals. The independent panel of judges comprised the Economic Development Board, IE Singapore, the National Environment Agency, the National University of Singapore, Spring Singapore, the Institute of Technical Education, KPMG and Frost & Sullivan. SBF is also embarking on a series of workshops to enable firms to benchmark their sustainability efforts against other Singapore companies and industry best practice. 'This knowledge will help businesses improve their environmental impact, and empower industries to improve collectively,' SBF chief executive Ho Meng Kit told a gala dinner yesterday. The awards were handed out at the dinner by Mr S. Iswaran, Minister in the Prime Minister's Office and Second Minister for Home Affairs and for Trade and Industry, who was the guest of honour.